It's been a dark time for the medical device maker, but some lights at the end of the tunnel gave investors a reason to cheer last month. Shares of Endologix, Inc. (NASDAQ:ELGX), a medical device company focused on aortic disorders, gained 19.9% in January, according to data from S&P Global Market Intelligence. An apparent end to manufacturing issues that had been halting shipments of key products gave the market a reason to quit beating up the troubled healthcare stock. Endologix shares were pummeled last year, falling from more than $14 over the summer to around $5.30 in late December, when the company announced a temporary hold on shipments of the company's AFX Endovascular AAA System. Management stated the hold wasn't related to reported side effects from physicians using the devices, but the market appears to have assumed the worst. At the end of December, the company announced that testing didn't reveal any problems with certain sizes and that it would begin shipping again immediately. Management also stated it would continue testing remaining sizes. The stock continued rising in response to the resumption of shipments of all sizes of the AFX2 mid-month, and they climbed again in response to reinstatement of the CE mark for the AFX and AFX2 that allows the company to market the systems throughout the EU member countries. Endologix has proven itself capable of making a splash in a space dominated by much larger competitors by producing impressive revenue growth in recent years. Unfortunately, its products aren't exactly flying off the shelves on their own. 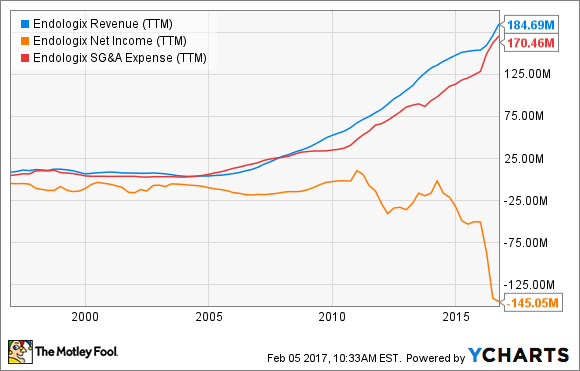 Sales, general, and administrative expenses have climbed right along with revenues, sending the bottom line deep into negative territory. ELGX Revenue (TTM) data by YCharts. Demand for devices to correct abdominal aortic aneurysms and related disorders might represent a $4.8 billion market by 2021. Unfortunately, it's hard to see how Endologix will turn the profitability corner while losses continue to outpace sales growth. The reinstated CE mark and other manufacturing issues are a step in the right direction, but I'd stay on the sidelines until margins show signs of improvement.